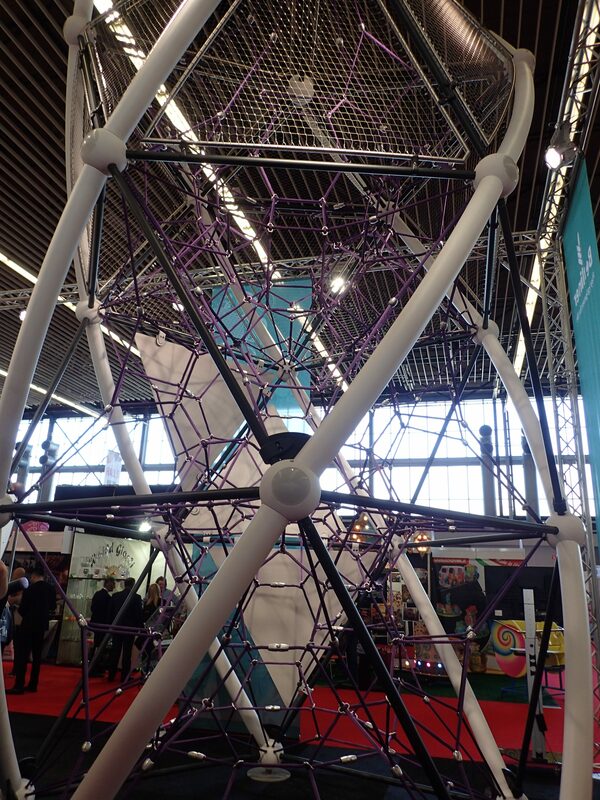 Sven: This week we paid a visit to the EAS in Amsterdam! It’s the event to see all types of companies related to theme parks and more! 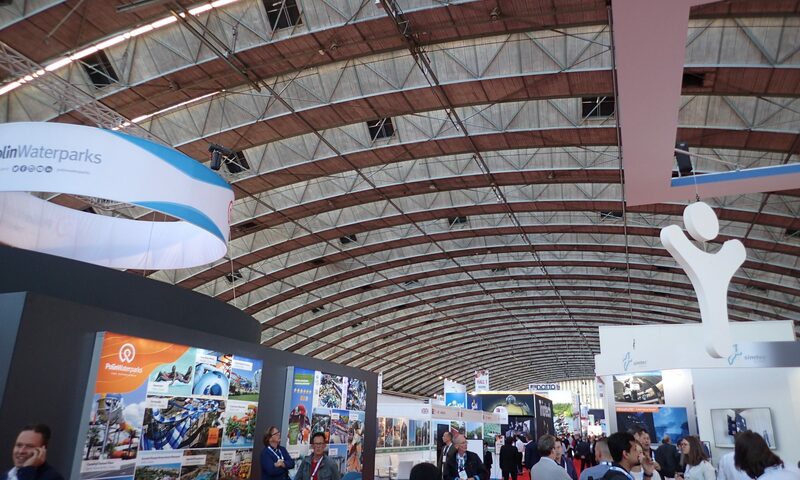 570 exhibitors and almost 16 000 visitors. Discover what was there to see! Where to begin on an event like this? Well, there were several halls to choose from. 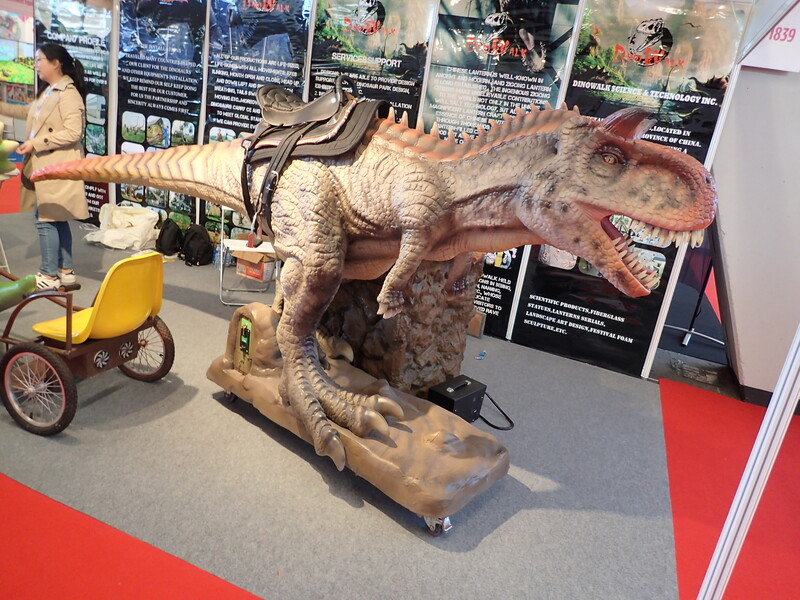 We picked the largest one to immediately see the big names and some of the interesting ride vehicles. 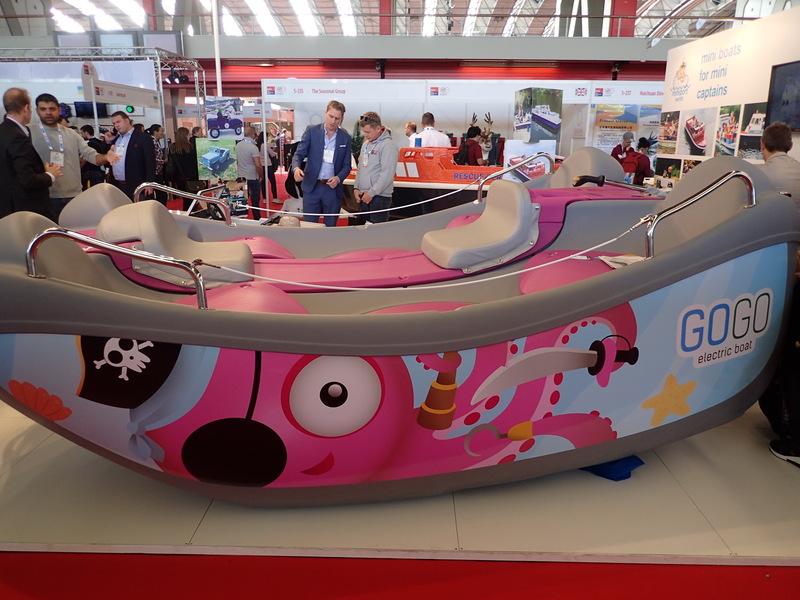 For example the ride vehicle from Eurosat Can Can Coaster at the Mack stand! Obviously this one already opened up. 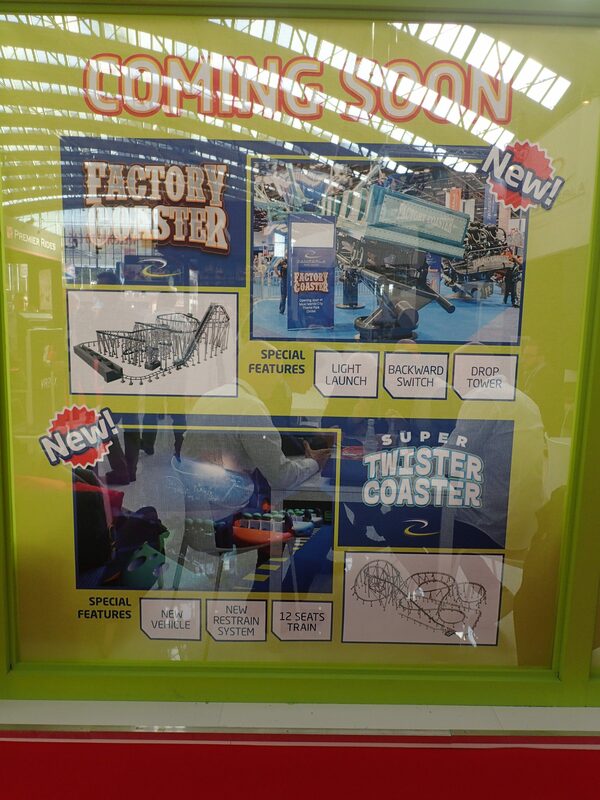 But it is pretty new and a nice Family coaster design. 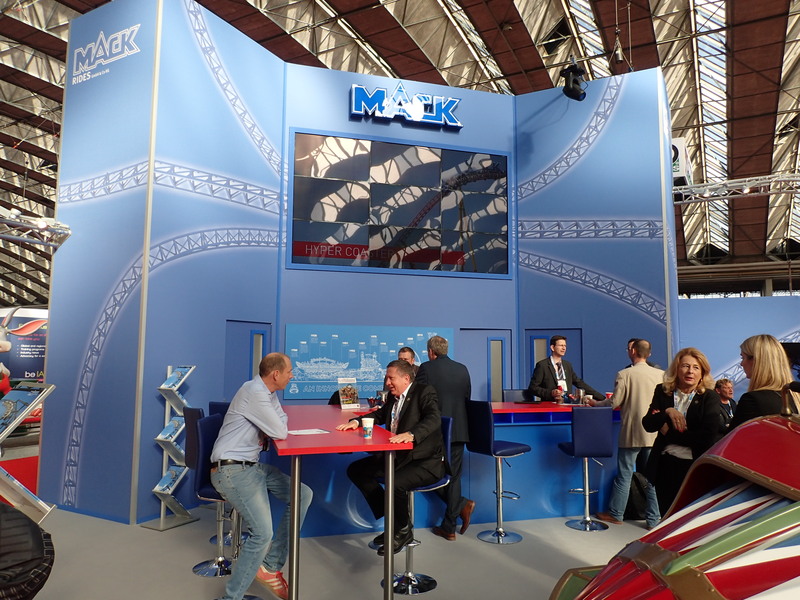 As we’re talking about Mack, ProSlide was quite close with a pretty huge display of several of their slides. Expect to slide some next year in Europa-Park in Europe’s largest indoor swimming pool Rulantica! As coaster enthousiasts, we passed by the big companies producing them. 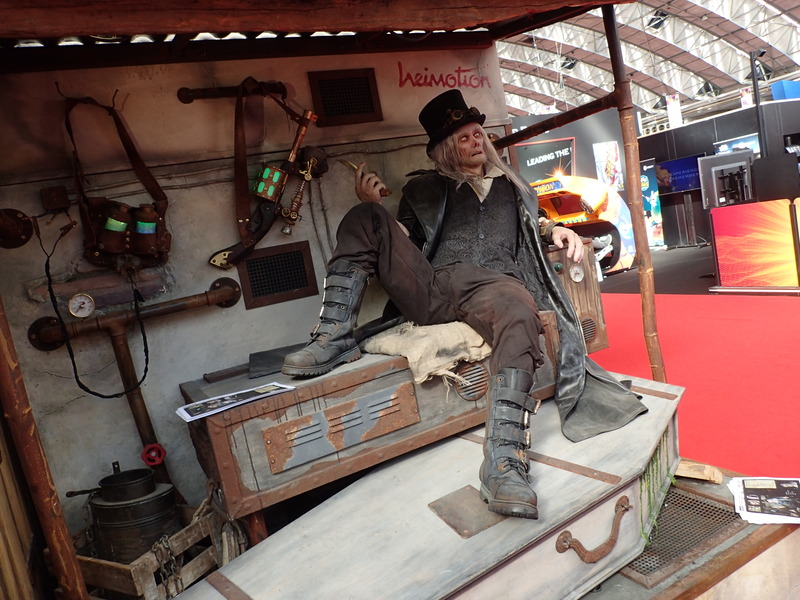 For example Gerstlauer had two displays with some nice looking models. One of them which we saw before as it holds the coasters for the new Nickelodeon Universe in New York. 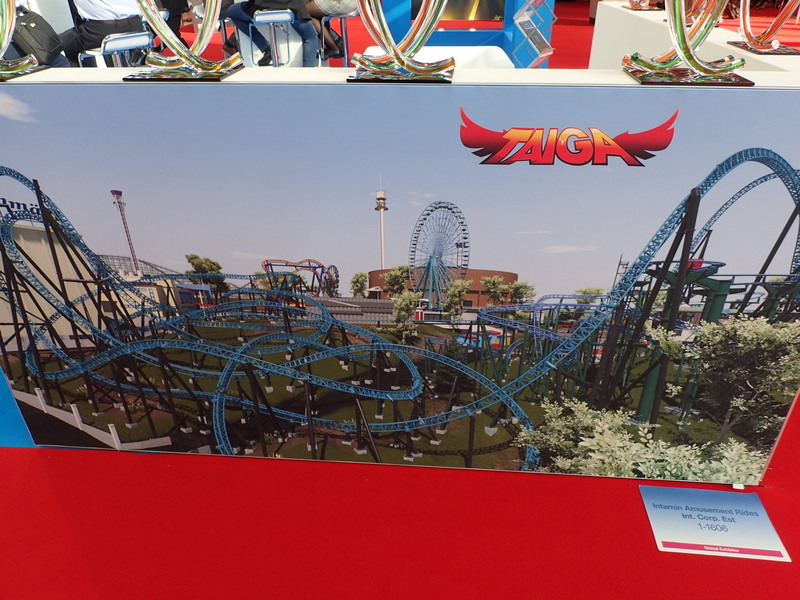 Zamperla had two new coaster types on the side of its stand. 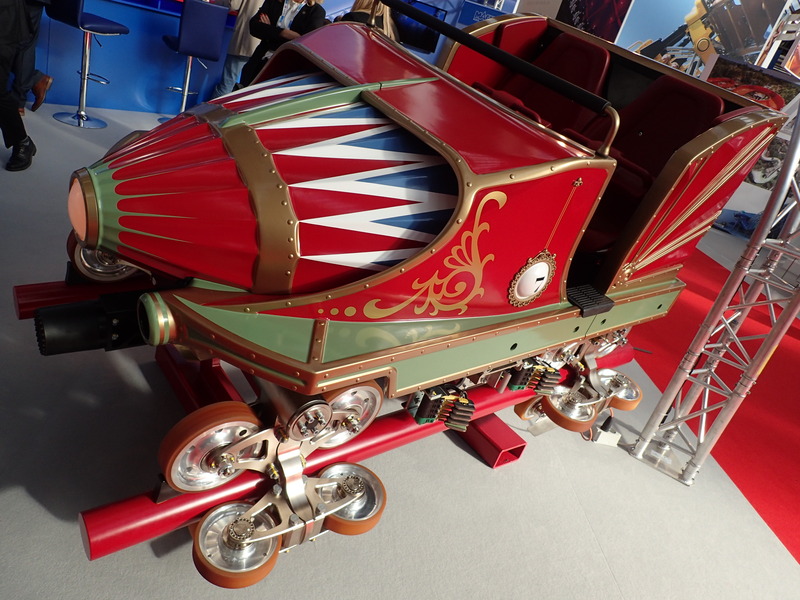 There was also a new train on display for the Ducati coaster coming next year to Mirabilandia! The special motorbike coaster will be built by Maurer! 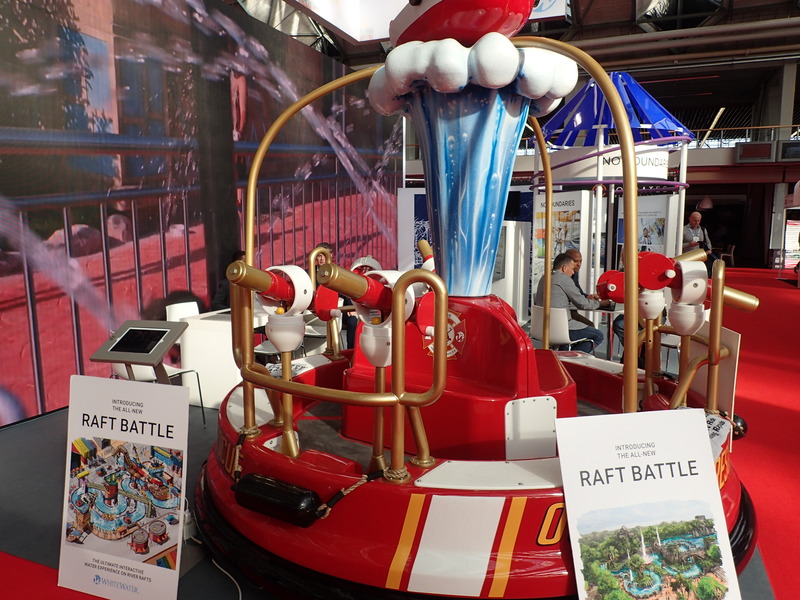 WhiteWater, which is a company known for its water rides, had a Raft Battle on display! Definitely could be a nice addition for some parks! 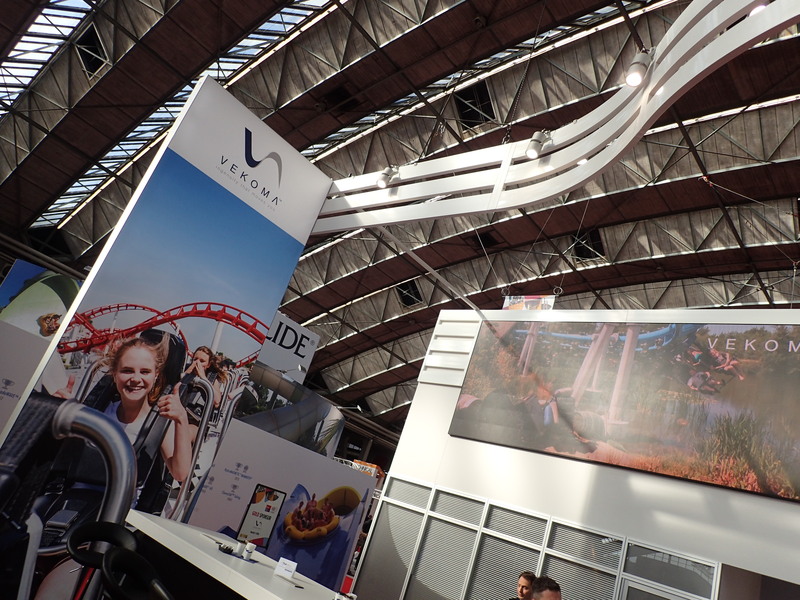 Of course, as we were in the Netherlands, Vekoma was present! Nothing special on display, but a nice looking stand nevertheless! 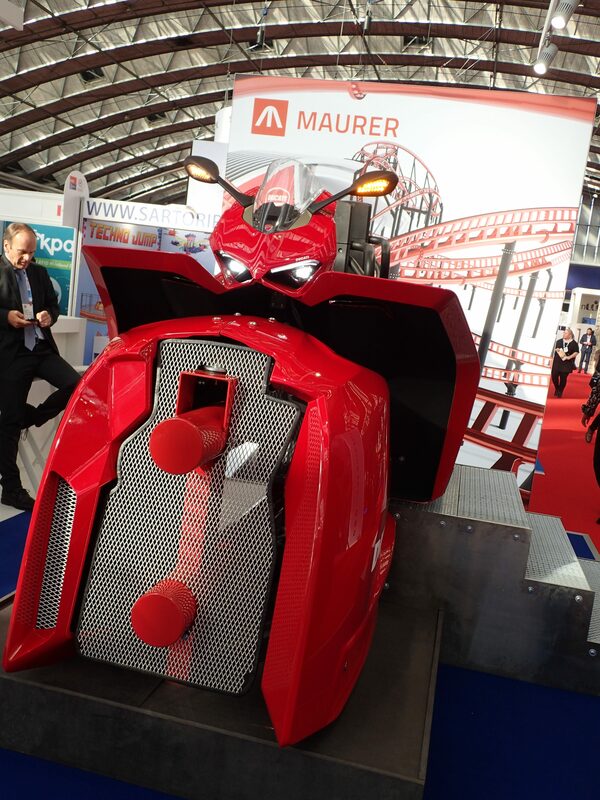 At ETF Ride Systems, we saw the first vehicle for the new Erratic Dark Ride opening next year at Walibi Belgium! 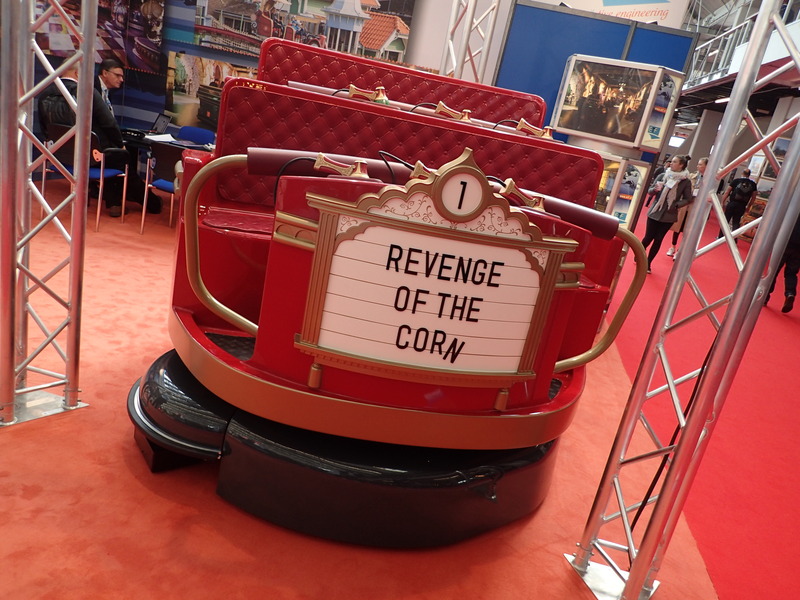 This Popcorn Revenge themed attraction will be non-linear where you’ll each time have a different experience. 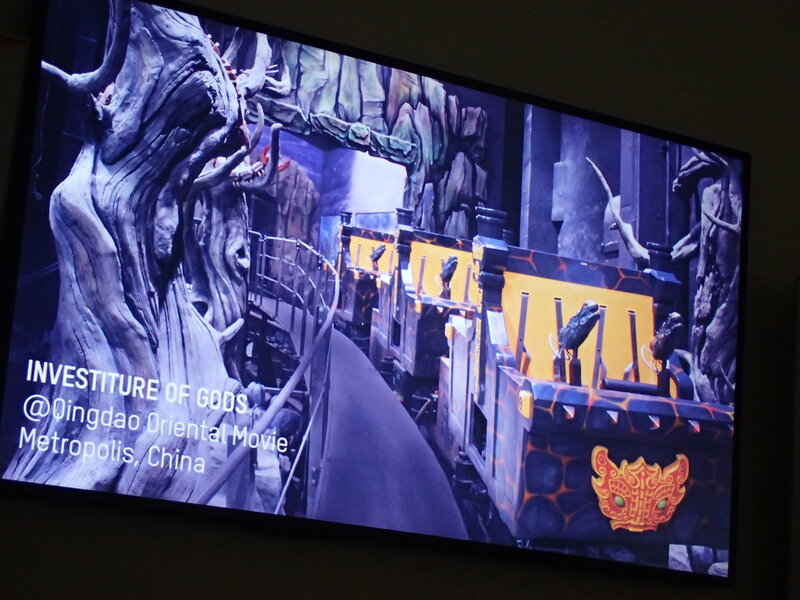 We learned a bit more about the ride itself on the Alterface Press Conference, the lead on the project, where they talked about the Popcorn design and this new type of dark ride. The original can host only about 500 people an hour, so an American customer ordered an XXL version! It’s unknown yet which park, but they will soon tell more. Also a Duelling version will soon appear in a theme park. CEO Benoit Cornet is excited about the future of the company as they are working on some interesting secret projects. 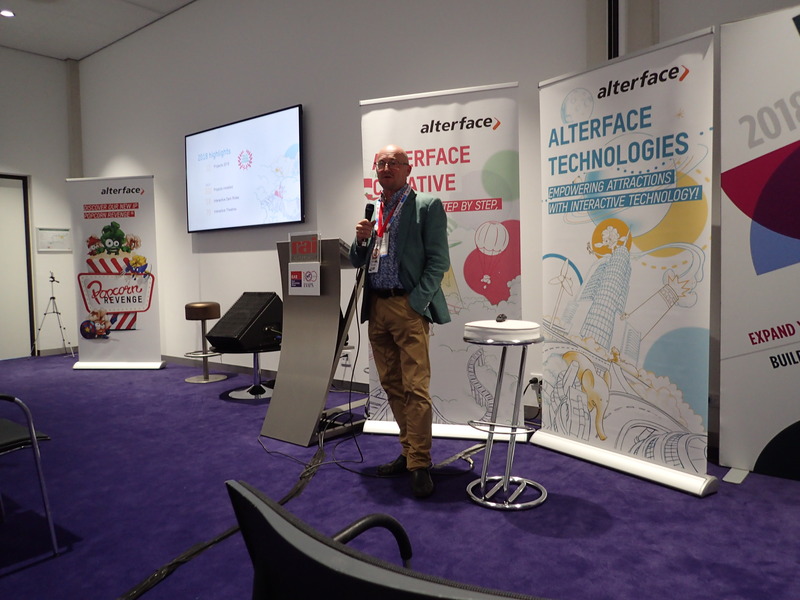 Alterface is market leader for interactive dark rides so they expanded to be able to deal with all types of demands for rides. We’re curious about what they will announce soon! One of their most recent projects involved the largest interactive indoor coaster which opened in Qingdao earlier this year! This Golden Horseshoe coaster is heavily themed plus has interactive points similar to Toy Story Mania and Maus-au-Chocolat! What’s more? 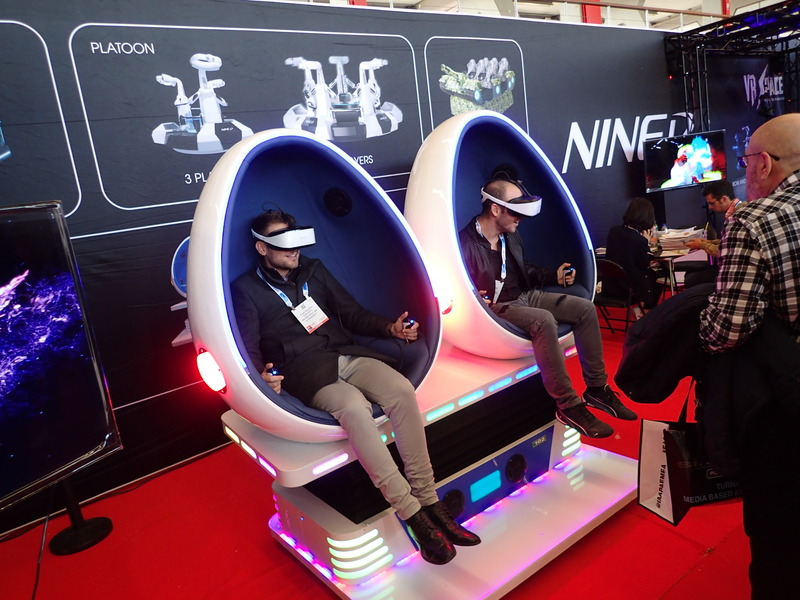 Well the big trend is still VR. 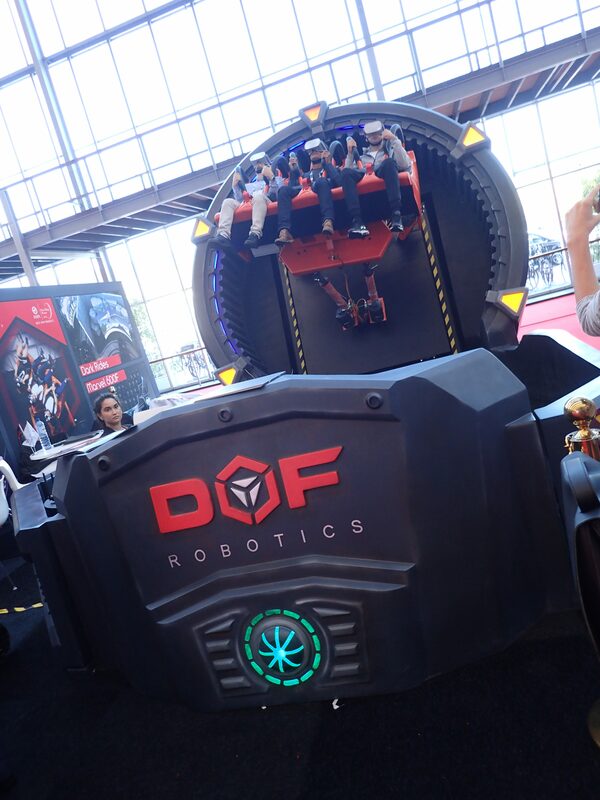 There were lots of VR attractions on the EAS, including this one by DOF Robotics. We tried it out and even though the system is remarkable, the movie itself needs some adjusting. But of all the ones we saw, it was the best looking! Truth is, some people really enjoy these type of experiences. Some are sitdown, some are walking around and more. But they are increasing the interactive element plus the communication with each other. 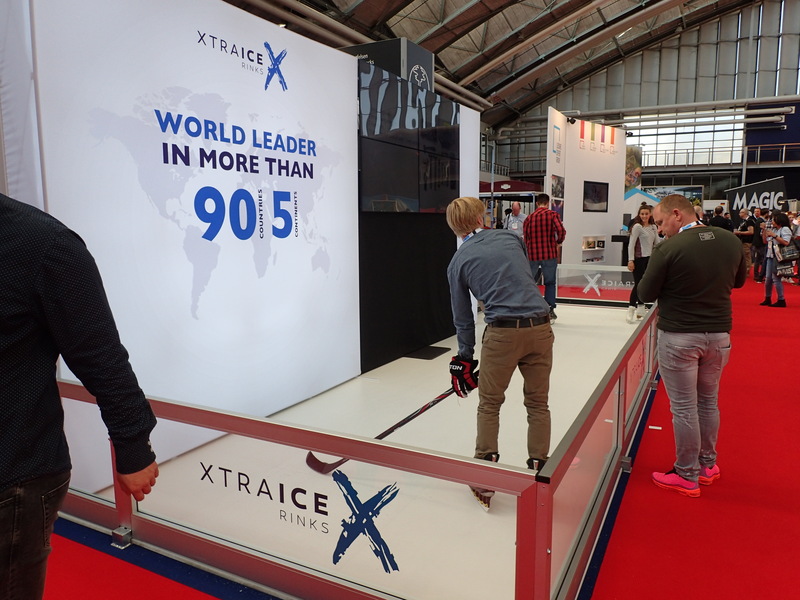 More interestingly we saw a game with drones that need to be controlled to hit targets. And how do you see the targets, well with AR glasses! Now that’s a lot more interesting. The company Drone Interactive is definitely a step ahead by combining these two hot technologies! 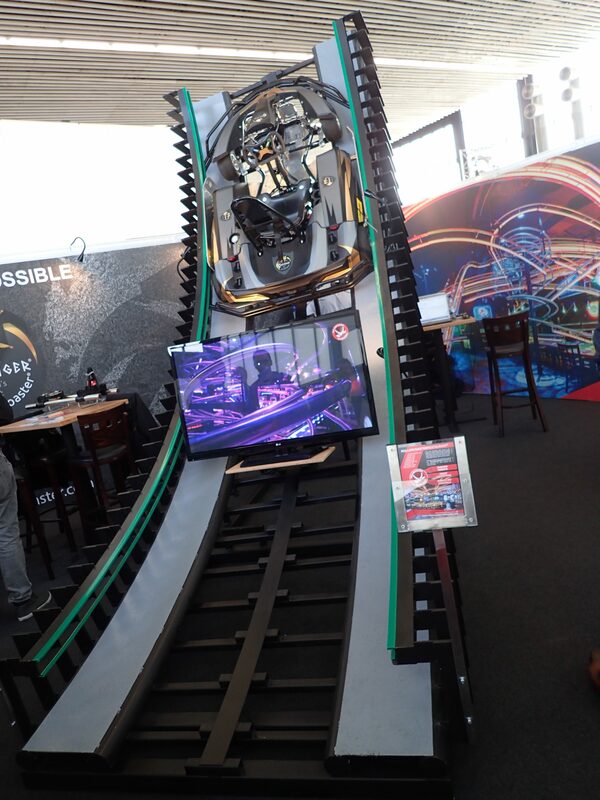 Another innovative display was this one: a karting track with loops! 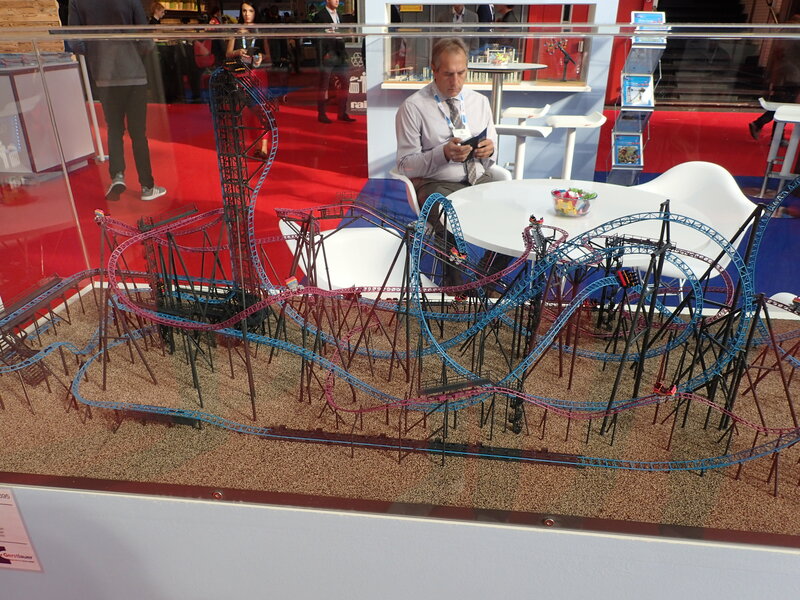 The Kartinger concept is from the same company where you can order a Rollercoaster Restaurant! 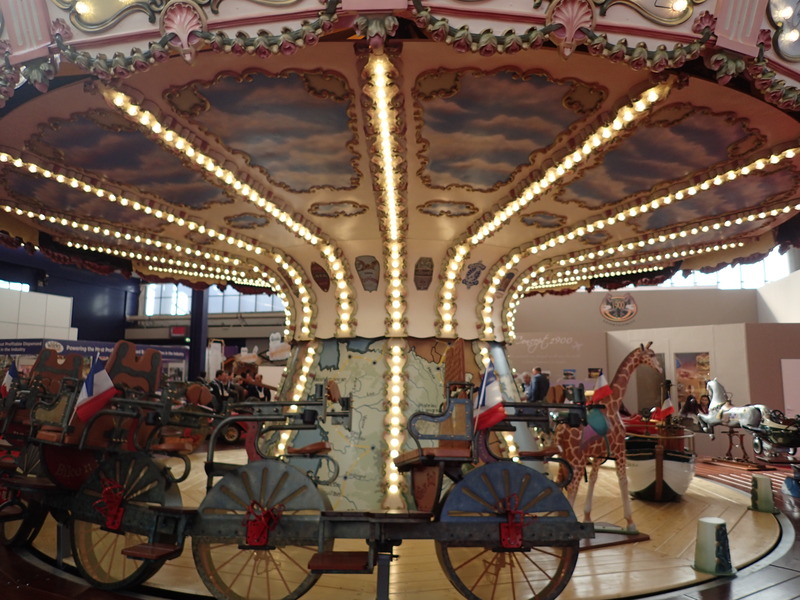 Yet, there are also the classics like this special looking carousel. Besides rides, there’s of course much more. Quite some theming and animatronics! Especially the dino’s were everywhere! 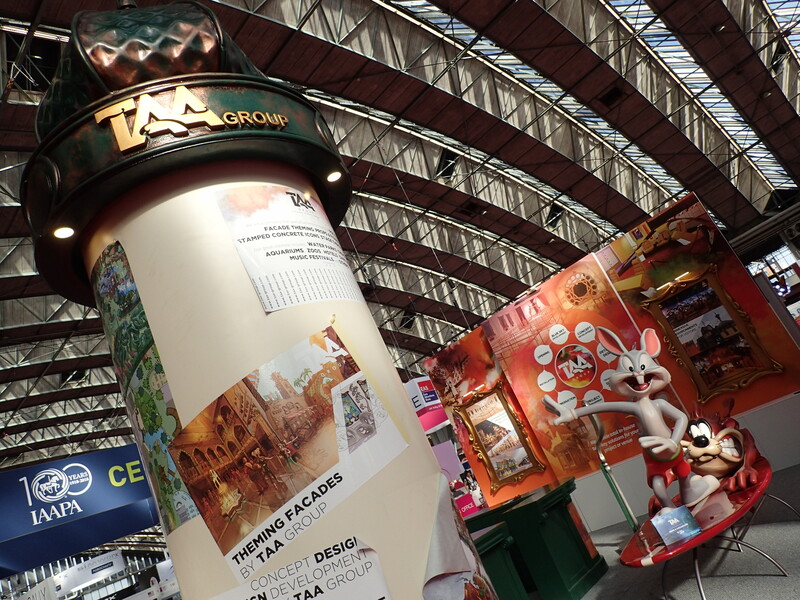 Another fun type of stands are of course the mascots! 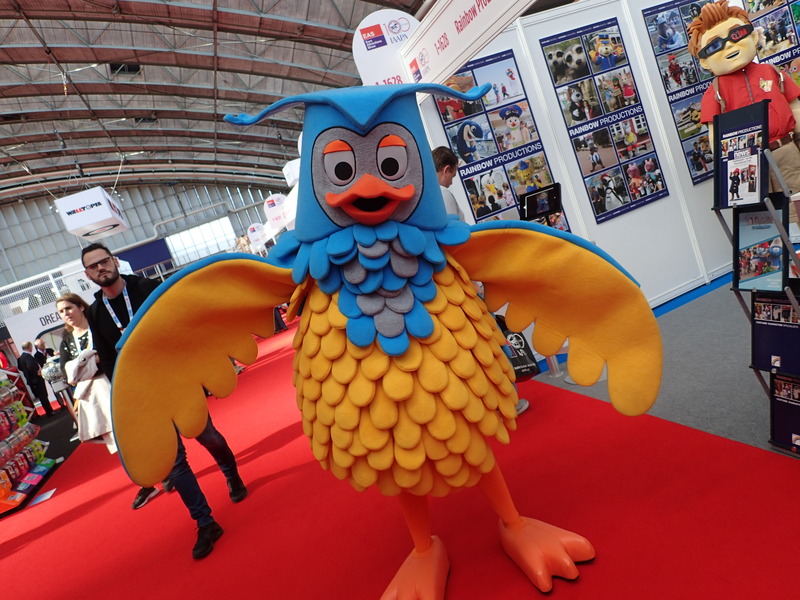 Mister Owl, a well-known Dutch character strolled around! 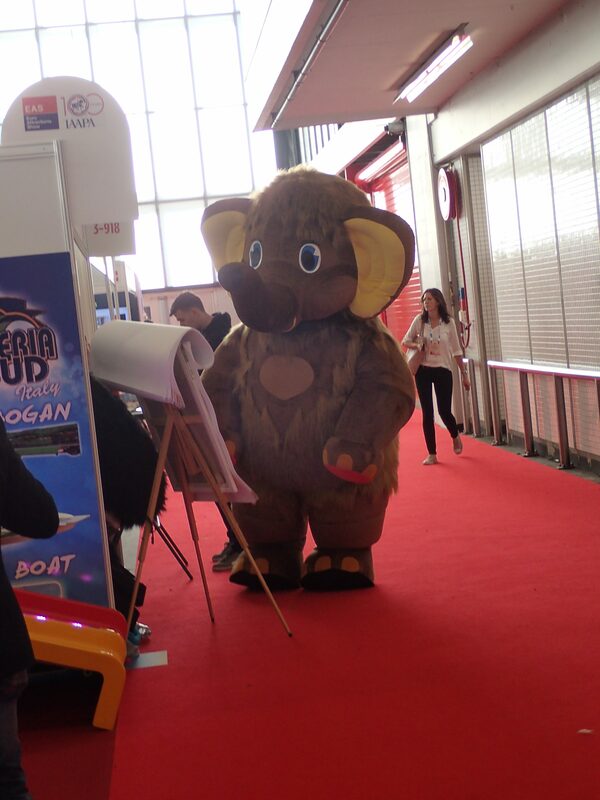 Also a huge elepehant was spotted. Of course, EAS is more than just theme parks. 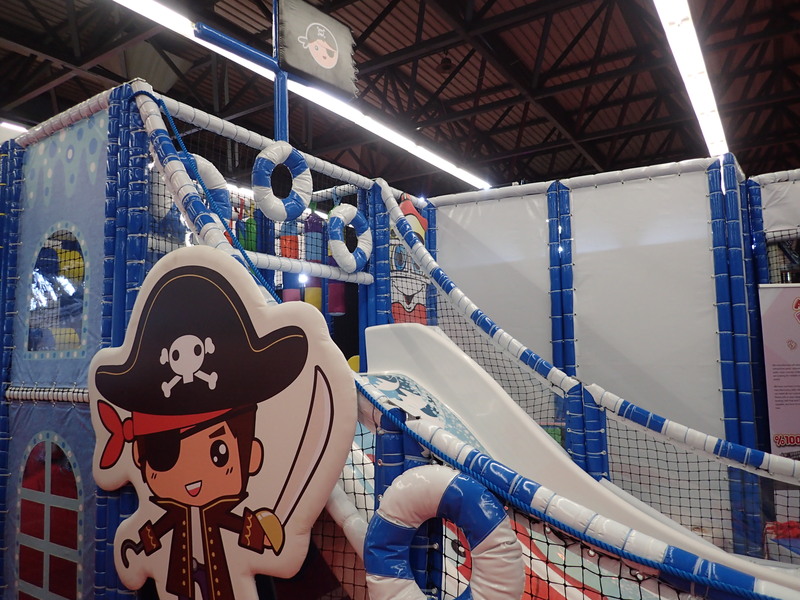 All kinds of compagnies were present for playgrounds, entertainment centers, suppliers and more. 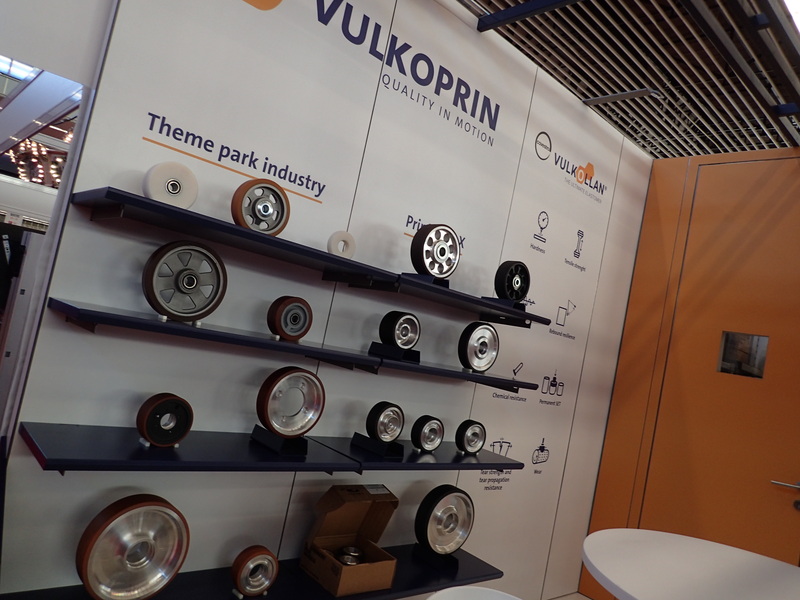 Let’s geek out with this coaster wheel supplier! We ended the day with a CEO Talk session. The three speakers: Michael Mack, Andreas Andersen and Ahmed Hussain. The first speaker is of course CEO of Europa-Park. 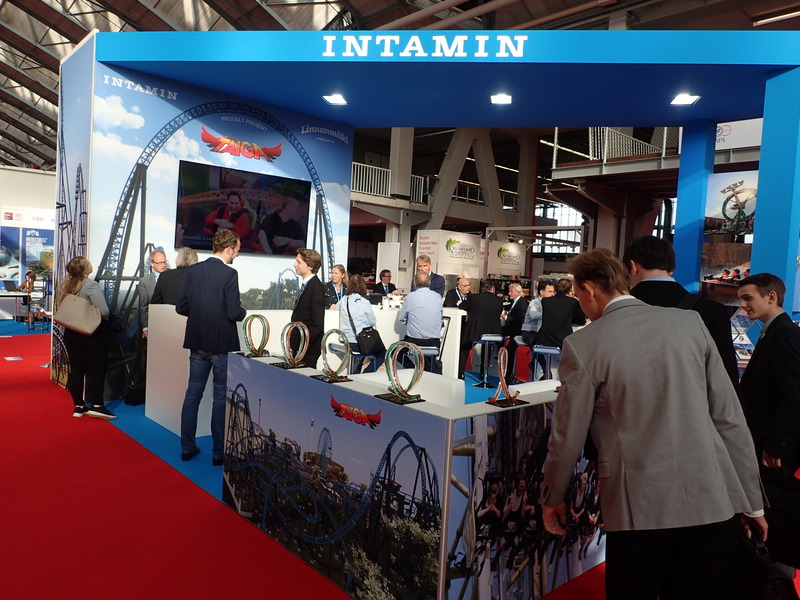 The second name is besides CEO of Liseberg also chairman of IAAPA at the moment. Lesser known is Hussain, CEO of DXB Entertainments. 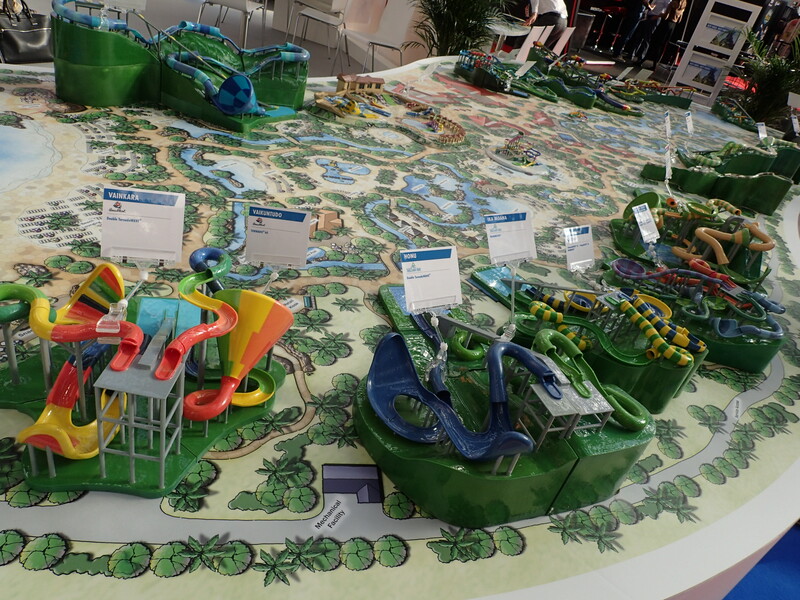 The Dubai theme parks in that group are Legoland Dubai, Motiongate and the future Six Flags Dubai. They talked about several topics like what qualities are important, how do they pass on their vision and how do they see the future of theme parks? This last question was answered best by Hussain. E-commerce challenges the retail, queues for rides and food and how do you build even bigger and better rides? Mack and Andersen however stressed the fact that there will always be a need for experiencing the real thing, for example at theme parks. There was also a possibility to ask questions, where we stayed on the future topic. Our question was how data collecting will influence their strategy? For both Mack and Hussain this will definitely be important to improve the guest experience in the future. However, Andersen doesn’t want to take all its decisions based on it. The gut feeling remains important. 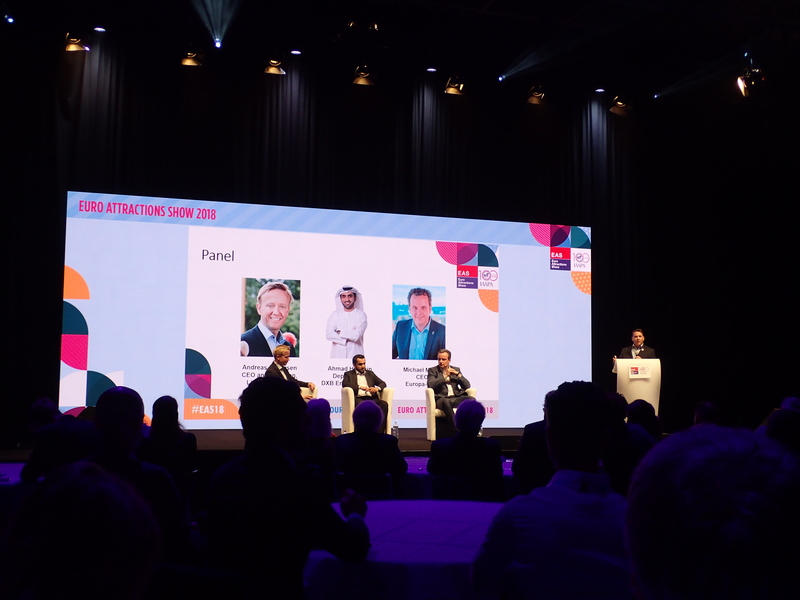 Overall, EAS was an interesting experience and we hope that both the theme parks, manufacturers and all kinds of suppliers made some interesting deals of which we’ll see the result soon! Previous PostPrevious Halloween Horror Nights 28 Review!